The Oast houses within The Hop Farm provide a unique and unusual venue for all Corporate Entertainment functions and Evening Events, whilst the surrounding 500 acres of land are perfect for Specialist Team Building Events, Experiential Learning Workshops and Corporate Family Fun Days. We have a wide range of function suites of all shapes and sizes; which can be combined to provide breakout areas or used to separate different features of a training conference followed by a Race Night, or Corporate Quiz We can cater for all types of group sizes with guest numbers ranging from 15 to 300 so whatever you are looking for from Team Challenge Company the Hop Farm is the ideal place to visit. 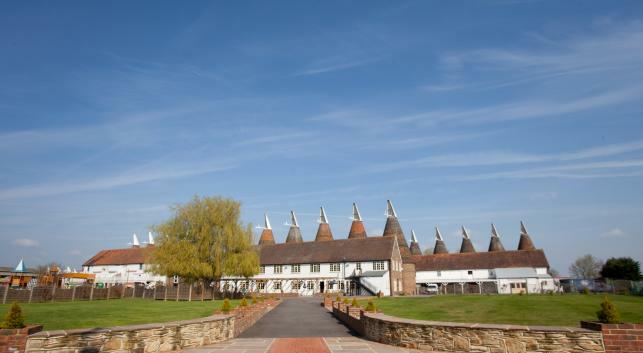 The Hop Farm is an ideal venue for your celebration, conference, meeting or team building event in Kent, easily accessible by public or private transport from London and surrounding counties. With 500 acres of land the event ideas for The Hop Farm are only limited by imagination so let Team Challenge Company give you a day to remember. There are plenty of flat fields, but The Hop Farm also offers woodland area, river frontage, touring facilities and an off road driving course. The Hop Farm is a unique and beautiful venue in the heart of the Kent countryside complete with a toilet and shower block affording you lots of exciting outdoor options from It's a Knockout events to Family Fun Days. Set amongst the largest collection of Victorian oast houses in the world, The Hop Farm, is a spectacular backdrop for possibly the most exhilarating day of your life so why not sit back and let Team Challenge Company take you there.